Physical fitness is one of the things that guarantee successful gorilla trekking tours in Uganda, Rwanda & Congo. How physically fit one should be to be able to see mountain gorillas is one of the frequently asked questions about gorilla trekking. While booking for gorilla tours, potential travelers are advised to ensure physical fitness prior to the actual gorilla trekking time. Physical fitness is emphasized to prevent challenges that come along with long hiking hours and in areas of high altitudes. 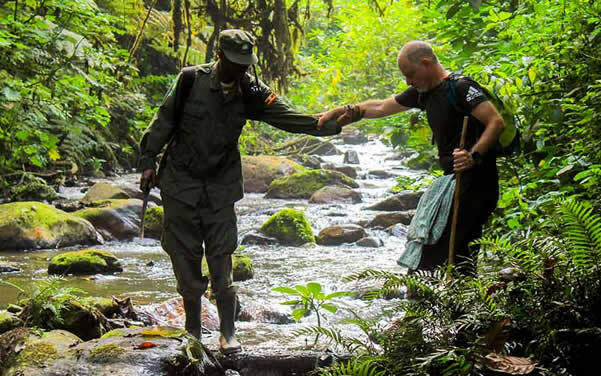 Travelers who arte physically fit are therefore assured of smooth gorilla hiking tours without challenges since being fit is one of the key essentials for every successful gorilla trip. Mountain gorillas live in areas of higher altitudes, which tae travelers several hours of trekking before meeting the endangered species. During the pre-trekking briefing, travelers are reminded to disclose their physical fitness to travelers so they can be given gorilla families suitable for them. How are mountain gorillas allocated? Each morning during the pre-trekking briefing, travelers are put together in groups of eight each allocated to new gorilla group for an hour. The allocations of gorilla families depend on different factors among which include the traveler’s physical fitness. Some gorilla families live in high altitudinal areas while others in areas of low altitude. Travelers who therefore less physically fit, the aged and weak are given gorilla families in areas of low altitude while the physically fit are given hard to trek gorillas. The trekking time vary depending on the location of a gorilla family and their speed of movements. These confirm travelers that one’s physical fitness cannot prevent him/her from seeing mountain gorillas. Which exercises should I do to be physically fit? As said already, travelers intending to trek mountain gorillas are advised to do enough exercises to ensure physical fitness when time to trek gorillas come. Among the things they are advised to do include hiking, walking, going to the gym and stretching among others. These prepare you well for gorilla trekking. What if I fail to reach where gorilla are? For those who cannot make it to the mountain gorillas, there is a provision of sedan chairs. Here a traveler is carried by four porters into the jungle along with other travelers in the group. A traveler carried pays extra cost to pay for the porters who carry him/her to and from the jungle. Sedan chairs are mostly used for the disabled and the aged who cannot hike for long hours and in the slippery muddy grounds especially in the rainy season. Detailed knowledge about gorilla destination and what makes them different is very essential before confirming any gorilla safari. Mountain gorillas only live in two regions, which are Bwindi Impenetrable forest national park, and the Virunga massif shared by Volcanoes national park Rwanda, Mgahinga gorilla national park Uganda and Virunga national park in Democratic Republic of Congo. Each destination has its exceptional features and determining which destination is best to see gorillas is therefore a choice of a traveler. Bwindi forest in southwestern Uganda shelters the highest number of gorillas with 17 gorilla families habituated for trekking. Travelers are reminded to carry enough drinking water and energy giving snacks to keep them strong during hiking. Other must carry essentials on a gorilla safari are hiking boots to ease movements in the slippery muddy grounds, rain jackets for the unpredictable forest weather, hand gloves to prevent being hurt by thorny bushes, sun glasses and a hat for protection from direct sun.